As you all know, recently, Google has done a major release by improving the text ads and making them even large - by adding an extra headline and description to all your expanded text ads😃. Now, you can generate reports on the same in ReportGarden too. Isn't this an icing on the cake? 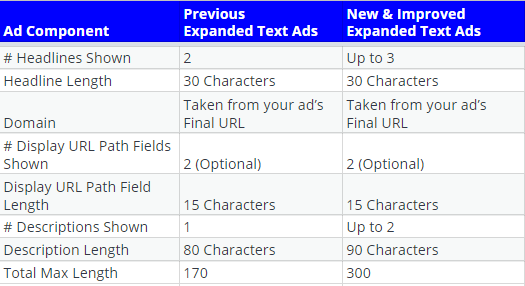 Google released the first Expanded Text Ads in 2016. Overnight, ads grew 50% in size. On an average, advertisers saw their ads’ click-through rates (CTR) increase by 20% after this change. In the past two years, the change is rapid and we search more often for answers and our devices have become large. 140 characters wasn’t enough and Google realized the same thing. That's why, Google recently made changes to the text ads so that you have more room to convey your message to customers. In ReportGarden, you can now generate reports on the improved expanded text ads. Below is how an example text ad looks like. Drag and drop the table widget. Choose 'Text Ads' in Dimension. Select a campaign in the advanced tab.